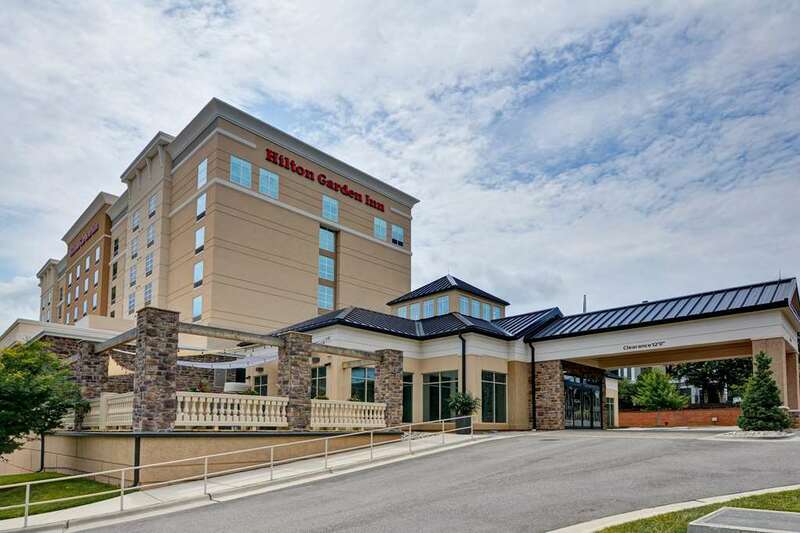 Hilton Garden Inn Raleigh/Crabtree Valley hotel is centrally located between downtown Raleigh and RDU International Airport. The hotel is adjacent to Crabtree Valley Mall with 200-plus shops restaurants and entertainment. This hotel allows for easy access to all Raleigh local destinations including North Carolina State University. Retire to your spacious guest room featuring granite surfaces a mini-fridge a microwave and a Mirra Chair by Herman Miller with ergonomic work desk. Browse over 33 HD channels on the 47-inch flat-screen TV and stay connected with complimentary WiFi. Choose our inviting seventh floor Executive Suite for the ultimate stay offering more space and wonderful views of Crabtree Valley. Dine in style at our Raleigh NC hotel. We offer American cuisine for breakfast and dinner in the relaxed Garden Grille and Bar. Energize in the complimentary 24-hour fitness center with PreCor equipment or swim in the heated indoor freshwater pool. Print documents remotely from your guest room to the business center. An ideal setting for meetings training sessions and social events we offer over 7 000 sq. ft. of indoor and outdoor event space including a divisible 5 720 sq. ft. ballroom. State-of-the-art A/V catering services and our professional events team will ensure your function is personalized and exceeds your every expectation. Garden Grille - Bar: Serving breakfast lunch and dinner daily The Garden Grille - Bar offers a contemporary American menu. Join us after a long day of travel or enjoy the company of friends or colleagues in the bar. Let our bartenders mix up your favorite cocktail or enjoy a local craft beer.